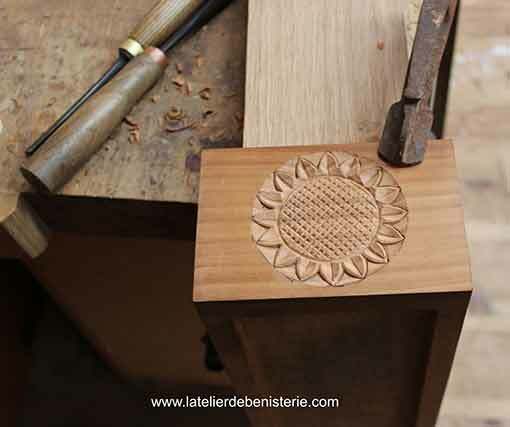 The sculpture is an integral part of cabinetmaking. Some woods are harder to work than other. The decorative elements for furnishing or the doors are called in relief. There are low reliefs and high reliefs. This is the depth of the relief that varies on the plain background. The high relief defines an element almost detached from the bottom, three quarters of the real volume. The bas-relief includes sculptures of lesser depth. The sculptures in round bump designates an element in three dimensions, which we can turn around and they are generally presented on a base. These pieces can reach miniature or monumental dimensions.